This Old Fashioned at Bon Bon didn't last long after posing for this picture. There are a lot of reasons to hit the Garland Theater, from the cheap movie tickets to the special events like Rocky Horror Picture Show screenings to the inherent coolness of seeing a flick in a single-screen, 70-year-old historical landmark instead of a newfangled mini-stadium at a mall. The top of my list is Bon Bon, the small bar adjacent to the theater's lobby where some of the first craft cocktails in Spokane were born, and where the vibe is consistently friendly and the decor decidedly funky thanks to a rotating art show on the walls mixing with the film-themed touches throughout. The tight curving bar makes maximum use of Bon Bon's space, and there are a few tables and a consistently busy patio just outside the door when the weather is nice. And while crowds show up later in the evening for trivia on Mondays or bingo on Wednesdays, the happy hour at Bon Bon is worth a visit whether you're sticking around for a movie next door or not. As the craft cocktail boom has found its way into many bars in Spokane, the prices of those drinks have risen to some uncomfortable heights. Not so at Bon Bon, and especially at happy hour, when a seasonally changing menu offers several craft cocktails for just $5 each, in addition to a dollar off all wine and beer. The current cocktail menu includes a Basil Collins (gin or vodka, lemon, lime, simple syrup, basil and seltzer), a Bon Bon Sour (bourbon, lemon, lime, simple syrup and bitters) among its offerings, as well as the Old Fashioned (rye or bourbon, sugar cube, bitters) that sticks on the happy hour menu even as other offerings rotate. Manager Cabby Barnard says "the Old Fashioned is probably the most popular cocktail" for Bon Bon's customers. I can vouch for the fact they go down easy. Dangerously so at Happy Hour prices. The mix of rye, bitters, sugar and a little orange peel can be impossible to resist even with other tasty options filling the menu. Besides trivia and bingo, Bon Bon is now participating in First Friday each month, when they'll debut a new artist's work hanging in house, and also have a different craft brewery doing a tap takeover for a night. Bon Bon is also planning a party to celebrate the Kentucky Derby on May 7, so find a big hat or seersucker suit and get ready to down some mint juleps. 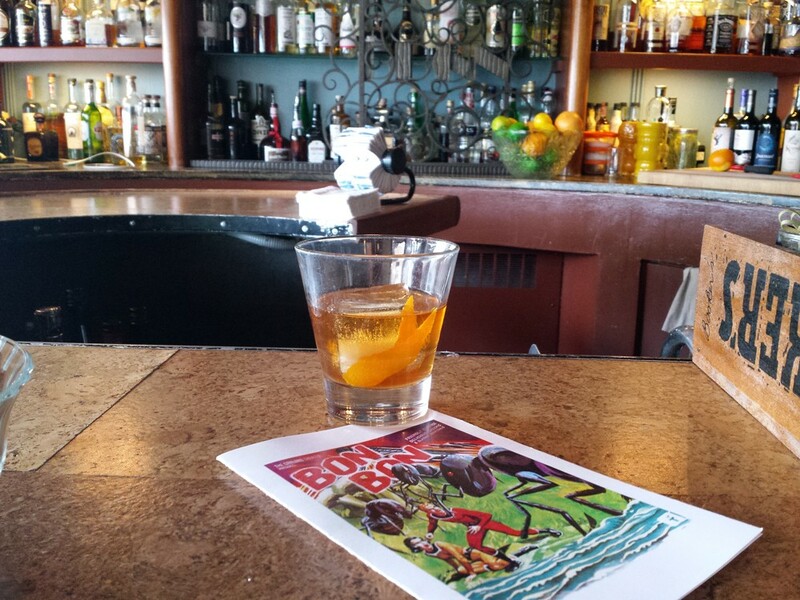 Happy Hour at Bon Bon is every Monday-Thursday from 4-7 pm, and all day Sunday. The special Happy Hour cocktails are $5, and all beer and wine is $1 off. For information on more Happy Hours in the region, use your phone and go to Inlander.com to download the Inlander's Drinkspotter app, or go right here.